My sincerest apologies to all my reader for announcing a publishing schedule I couldn't meet. Eight dogs in eight days has become five dogs in nine days, and the Soft Coated Wheaten Terrier, the Irish Terrier and the Irish Water Spaniel, amusing as they are, will just have to wait. Turns out there are only so many snide remarks you can make about the breeds of one locale before you start getting stale and repeating yourself. 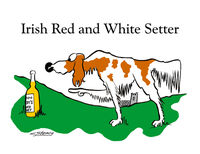 Same goes for the pictures, although any resemblance between the Irish Setter and Irish Red and White Setter images is purely coincidental. I'll be going back to a more leisurely schedule now, and providing, I hope, a better product. 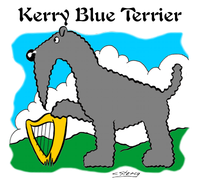 The Kerry Blue Terrier, like most terriers, was originally bred to hunt vermin, including rats, rabbits, fox, badger and the sort of lowlifes that would never stand a round at the pub. The breed gradually became an all-purpose working dog, used for herding sheep and cattle, as guard dogs and stocking shelves at big-box stores. The Kerry Blue seldom works in food service, being much too proud to wear a hairnet over its magnificent beard. There are several legends about the origin of the breed: that it originated from a cross between a Portuguese Water Dog that swam ashore from a shipwreck and was mated to all the female terriers in Kerry before expiring with a deep sigh and a vast grin; that the dog was developed for poaching back when only nobles could hunt with Irish Wolfhounds (poached is still the only way a Kerry will eat an egg); and that Saint Patrick created the breed from the last snake in Ireland after being thrown from the Irish Wolfhound he was riding. Kerry Blue Terrier pups are black at birth, and gradually lighten to gray. They seldom actually become blue, except some elderly females who use a blue rinse. Of the eight Irish breeds, four are terriers, which suggests that either Ireland is overrun with vermin, or that the Irish are obsessed with ridding their country of small four-legged critters and repopulating it with small four-legged critters that bark. The European badger weighs in at 40 lbs and the Glen was tough and strong enough to go to ground and dispatch the vermin soundlessly. The article doesn't indicate if this was done with knife or garrote. The Glen was also used as a Turnspit Dog. That is, it would walk on a wheel that would turn a rotisserie on which dinner was cooking. 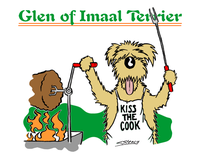 This is why the overwhelming majority of Glen of Imaal Terriers today are employed as barbecue chefs. The Irish Wolfhound is the tallest dog in the world, although individual Great Danes have occasionally surpassed it. As the name suggests, the breed was originally intended to hunt wolves, and they were very successful. There are very few wolves in Ireland today, and those that remain typically disguise themselves as snakes. Irish Wolfhounds also hunted elk, of which the few that remain disguise themselves as very big snakes. 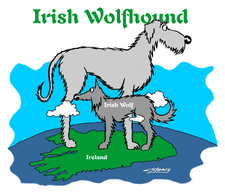 Irish Wolfhounds were also used in warfare, being trained to knock knights off their horses and lick them until their armor rusted through, thereby making the knights easier for infantry to kill. The breed is no longer used for hunting or warfare, since there's nothing left for it to hunt and the dog resents being used to transport either personnel or munitions. Modern Wolfhounds are generally employed as bridges or construction scaffolding. 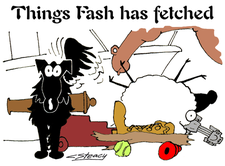 Between now and St. Patrick's Day, March 17, we'll be posting a different Irish breed every day, featuring the usual distortions of fact, insulting stereotypes, and ill-considered canine portraits we generally offer.